Juuls are a specific brand of e-cigarettes that have come to be known as the “Apple products” of vaping for their sleek design and portability. Although not all e-cigarettes or vaporizers are Juuls, Juuls have stood out in popularity and therefore have taken the brunt of the scrutiny. E-cigarettes entered the market in 2004 as a safe alternative to smoking, providing a nontoxic nicotine vapor in lieu of tobacco smoke. 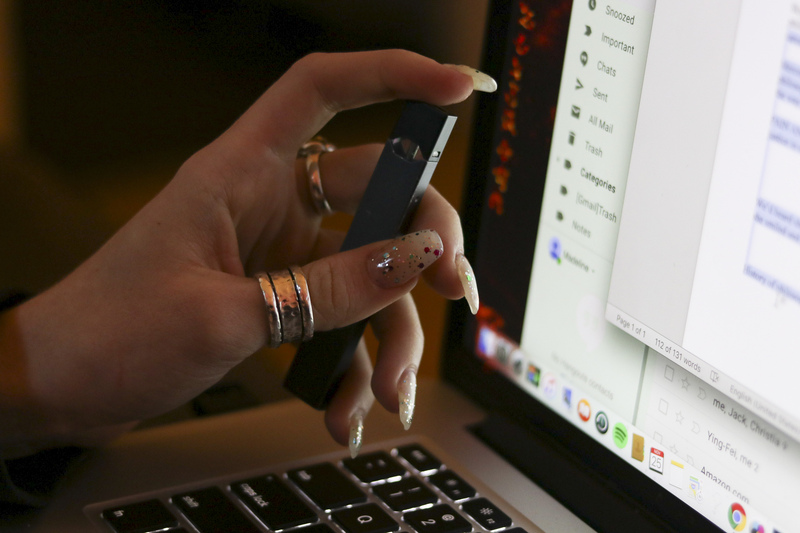 Although you must be 18 to purchase a Juul or any of the cartridges, the e-cigarette soon gained popularity among students as young as 12 or 13. Gemma Shay ’18 is an avid Juuler who taught high school students at Girls Who Code this past summer and noticed several of their campers sneaking off to Juul in the bathroom. Shay vapes a pod a day, but since their habit has gotten expensive, they’ve started refilling empty Juul pods with off-brand vapor juice. 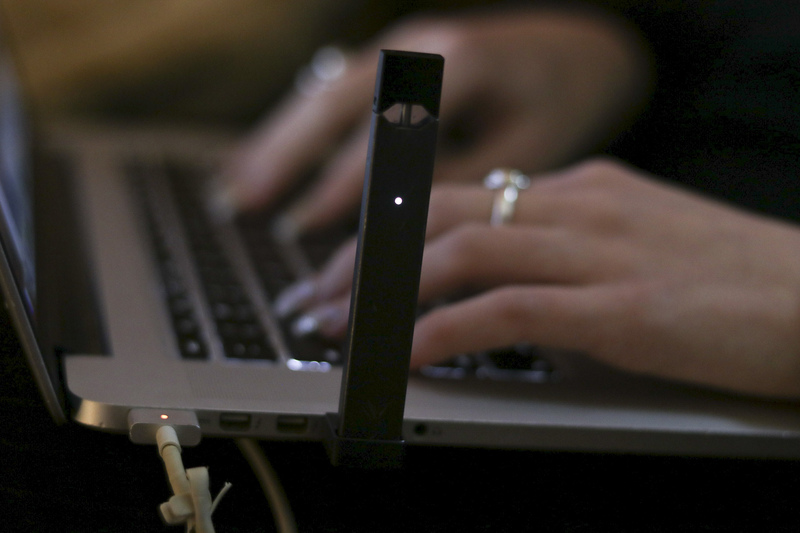 They began Juuling in an effort to move away from cigarettes. 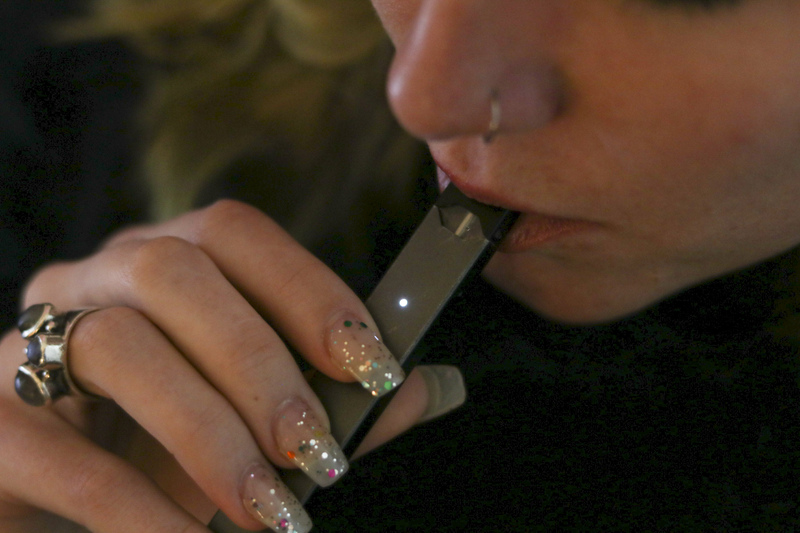 Shay noticed an uptick in Juul use their senior year, primarily among underclassmen. “I bought my first Juul off a freshman boy in Usdan who said it had an engraving, and then when I picked it up it had ‘Juul Boi Q’ carved into it with a knife,” Shay said. Although Juul’s official ingredient label contains no toxic or harmful ingredients, recent research has indicated that upon combustion, some of the flavor agents and substances in Juul pods can produce unsavory byproducts. Leticia Costa ’19 and Maya Marshall ’18 conducted a study within the Chemistry Department confirming that Juuls contain ingredients not listed on the packaging. 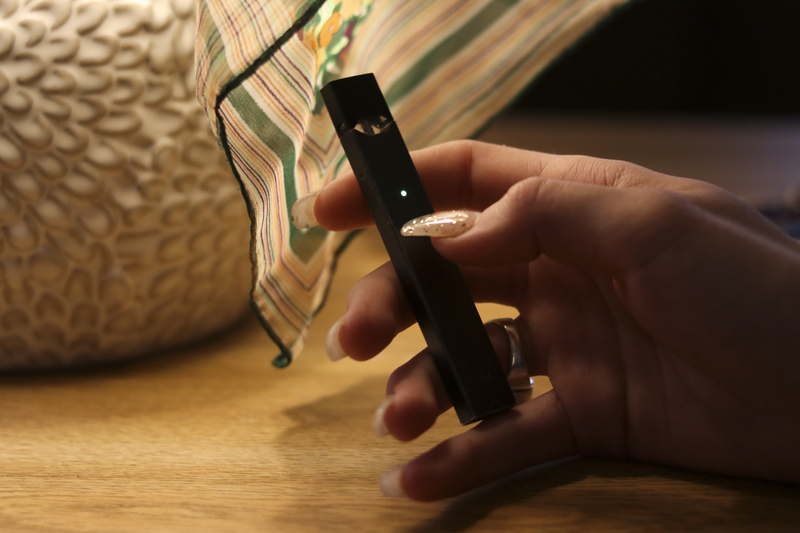 The experiment used both Menthol and Cool Cucumber flavored Juul pods, and the conclusion discovered the aerosol vapor contained various aldehydes and phthalates. Two of the main ingredients in most e-cigarettes are propylene glycol and glycerin, which under thermal decomposition (heat) can produce harmful gases such as formaldehyde. Although the specifics of the substances were not discovered in the study, its findings corroborated a dangerous unknown: that Juuls may not be everything they claim to be. Despite these uncertainties, some have found Juuls to be a reliable alternative to smoking. Rachel Eccles ’18 started Juuling to curb her cigarette use and is content with the results. Eccles believes it’s important to remember the benefits of Juuling, even as non-smokers confuse its original purpose. Unlike cigarette smoke, Juul vapor does not leave a lasting smell, making it more convenient for discreet workplace use. In an Argus Instagram poll of 96 students, 11 percent reported that they Juul regularly. Both Shay and Eccles have observed the Juul’s rise in popularity at the University. Eccles has noticed a divide between those who Juul recreationally and those who Juul as an alternative to smoking, especially in the athletic community. “The former is just as judgemental as non-smokers are about smoking,” she said. Because of the seemingly low stakes and high social pressure, many students fall into Juuling almost incidentally. Regardless of whether they Juuled or not, most students seemed to be in support of the new FDA regulations, if only to help them quit. Max Scanlon ’21 is another Juuler who sees the benefits of the new measures, even when they negatively affect him. Brooke Kushwaha can be reached at bkushwaha@wesleyan.edu and on Twitter @BrookeKushwaha.